Dimensions: 5-3/4 x 8.5 in. 128 pages. 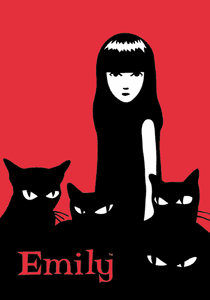 Introducing Emily the Strange, a smart and sullen thirteen-year-old with a posse of four cats and a bad attitude. This outspoken little girl has been making her name known across the country, bringing her thought-provoking phrases and nonconformist attitude with her. Now she makes her publishing debut with a pair of journals and a locking diary to inspire your own mischievous thoughts.